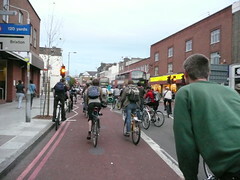 On Friday I headed along to this Months Critical Mass. It was very strange that the Police weren’t there at all to do the corking of the junctions, and hold back any frustrated drivers. The two usual off-duty bike paramedics were there. It took a while for the mass to get used to the idea of corking the traffic themselves. 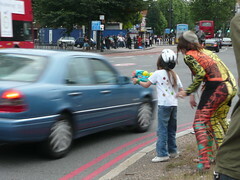 There was a few times when some drivers tried to have a run at some of the cyclists, which was quite frightening. 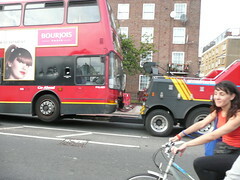 These possibly would have been less likely to happen with the bike police there. The key to preventing the drivers from being annoyed is to keep the whole ride moving all the time. After Buckingham Palace the ride managed split in two, with both halves meeting up later. At one point we did bump into a bunch of organised roller skaters. As the sun is setting around the time the ride starts off, so it becomes more difficult to get good photos, particularly with most people wearing reflective clothing. Overall it turned out to be a good night without any major incident. 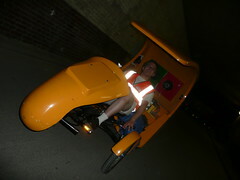 This entry was posted in Critical Mass, Cycling, London on September 28, 2008 by smsm1986. Quick catchup post. 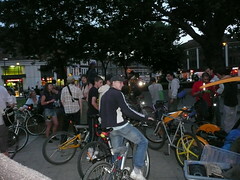 On the First Friday of July 2008, the first South London Critical Mass was held. On the way I done some mapping for OSM, finding some unnamed roads. I find Critical Mass useful for learning your way around London (or wherever it is held), as through random route will take you to parts of the city you have never been before. 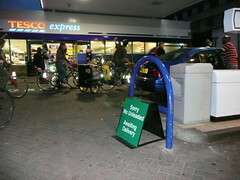 Seems that Critical Mass passes by fuel stations awaiting deliveries. 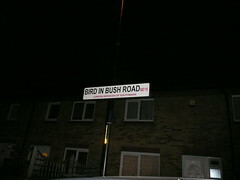 I wonder how Bird In Bush Road got its name. You can try some unusual bikes. 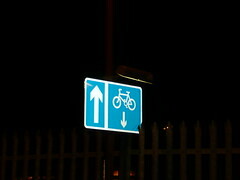 This entry was posted in Critical Mass, Cycling, OpenStreetMap on July 22, 2008 by smsm1986. Yesterday I cycled in the Edinburgh Critical Mass. 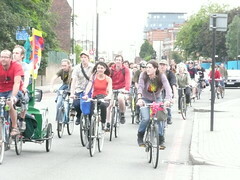 The idea about Critical Mass is to raise awareness of cycling. 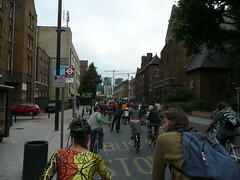 A large group of cyclists just get together and cycle around a city as a group. It is completely unorganised except the starting location and time. No route is planned in advance. Anyone in the group can decide to take the lead and the route is chosen on the fly by consensus. In Edinburgh, on the last Friday of every month at 17:30 for 18:00 set off, a bunch of cyclists get together at the the foot of the mound beside the National Galleries of Scotland. The cycle takes around an hour or two. 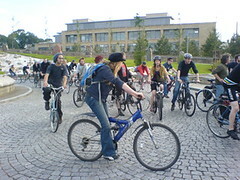 This entry was posted in Critical Mass, Cycling, Edinburgh, Maps, Pictures on May 26, 2007 by smsm1986.